Just when I was starting to think 2012 would pass by without an appearance from yours truly on TV was going to happen … BAM, I’m still Burger Famous. In 2011 my Burger Conquesting self was on TV four times including an entire episode featuring Idle Hands on the Cake Boss. I was getting a little used to all the Burger Fame and being rockingnized out there in the Burgerverse. With only a couple weeks left in the year, I was starting to think that TV had passed on the idea of The Rev being a spokesman for Burger Fanatics everywhere. Well that all changed today thanks to “The Doctors” on CBS. Recognize that Burger? Probably not but it’s from the Shipwreck Tavern in St. Thomas. How do I know that? THAT’S MY HAND!! In fact, that’s not just my hand clutching onto a hefty hunka Burg, that’s my signature move, The Left Hand Grab. Every time I eat a Burger, I snap off a picture of it once I am a few bites into it. The idea is to show you a cross section of the sandwich so you get a sense of the whole thing. I’m right handed so I always hold the camera in that hand. 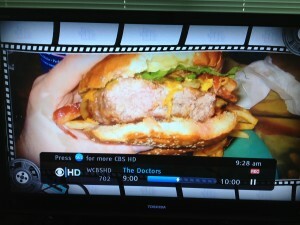 On today’s episode “The Doctors Take On Los Angeles” they did a feature about how pink should a Burger be when you bite in. For that feature, they used 4 pictures from Burger Conquest of Burgers that were too rare. The last one of the bunch, from the Shipwreck Tavern, was the last meal my brother Matt had before he became a married man. And if that’s not proof enough for you, chiggity check the “thanks” section on “The Doctors” website. This entry was posted in Burger Famous, Burgers, Gourmet Burgers, Hamburgers, New York, TV and tagged "left hand grab", "the doctors", best burger nyc, burger conquest, Burger Famous, cbs, cheese, ciancio, french fries, hamburger, new york, ny, nyc, rev, review, take on los angeles, television, the rev meter for social community, tv. Bookmark the permalink.